Research at the Institute of Molecular Biology and Biotechnology, published today in the premier international scientific journal Nature, reveals an intricate molecular mechanism that coordinates the biogenesis and selective elimination of mitochondria, to regulate cellular energy homeostasis during ageing. Mitochondria are indispensable and highly dynamic, energy-generating organelles in all eukaryotic cells that also play pivotal roles in fundamental cellular processes. Alterations in mitochondrial number, morphology, and function heavily impact cellular metabolism, and critically influence organismal physiology, health and lifespan. 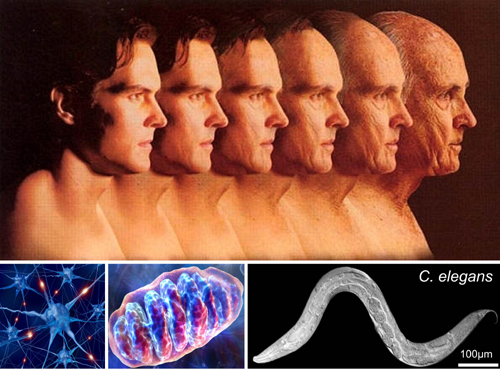 Mitochondrial dysfunction is a major hallmark of ageing and age-related neurodegenerative diseases, which highlights the significance of proper mitochondrial function. Therefore, maintenance of cellular and organismal homeostasis necessitates a tight regulation of mitochondrial biogenesis, balanced with the removal of damaged mitochondria. A wide range of complex and highly specialized molecular and cellular pathways have evolved to preserve mitochondrial homeostasis. Mitophagy is a selective type of autophagy mediating the elimination of dysfunctional or aged mitochondria, and the major mechanism by which cells regulate their mitochondrial content in response to stress of metabolic state. How cells coordinate the two critical and opposing processes of mitochondrial biogenesis and mitophagy to maintain cellular and organismal energy homeostasis was a mystery. IMBB researchers Konstantinos Palikaras and Dr. Eirini Lionaki, headed by Prof. Nektarios Tavernarakis, have now discovered a sophisticated molecular pathway that tightly links mitochondrial biogenesis with mitophagy, to preserve energy homeostasis and promote longevity. Using the simple nematode Caenorhabditis elegans, IMBB researchers uncovered the central node of the pathway, an evolutionarily conserved protein on the surface of mitochondria, called DCT-1/NIX, which integrates both extrinsic and intrinsic signals to control mitophagy. Accumulation of damaged or superfluous mitochondria causes oxidative stress, initiating a dual retrograde response that orchestrates the induction of both mitochondrial biogenesis and mitophagy. This closed feedback loop preserves mitochondrial quality by neutralizing damaged, and generating fresh and healthy mitochondria, thus promoting longevity. Importantly, coordination of biogenesis and turnover of mitochondria enables cells to adjust their mitochondrial content in response to physiological demands, stress and other intracellular or environmental stimuli. In this context, age-related decline of mitophagy both hinders removal of damaged mitochondria, and impairs mitochondrial biogenesis, instigating aberrant accumulation of mitochondria. The novel findings reported by IMBB investigators reveal an elegant molecular mechanism, by which diverse physiological signals are integrated to modulate cellular mitochondrial content. The tight evolutionary conservation and ubiquitous expression of the regulatory factors involved in this highly coordinated response suggest that similar pathways uphold mitochondrial homeostasis to modulate lifespan across diverse organisms including humans.